Holds 300 3 1/2 x 5 pictures. Is very tight and no writing inside - shows no wear. Photo quantity : 300pcs. photo size: 4R OR 6". Good wear resistance, fashionable and wonderful for your daily use, also perfect as a creative gift. Material: paper(Cover ), PP (inner pages). With delicate cover, the album looks very cute, all the joy of your love and adventures through the years in the exclusive photo album. Slip-in pockets. Holds all sizes up to 3.5" x 5.25". Back cover has a puncture with dent see pictures. Pages lay flat, making it easier to write special information above each photo. Slip-in pocket pages securely hold & Protect your photos. Included: 1 x Photo Album. Inner material: PP transparent film. Storage photos well by put them in it. Material: Paper cover. Model: 025. If item is defective after 3 months, you can still send it back to us. Photo safe: Acid, lignin and PVC free. Holds 300 photos up to 4"x6". Photos are displayed three per page. Photo Safe: Acid, lignin and PVC free. Blue photo album with gold trimming. Holds up to 300 photos. 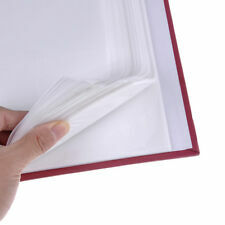 PVC, Acid & Lignin Free Archival Pages. Memo writing Area. 4" x 6" photo slip-in slots. ❤️Pioneer Wedding Book 1988 Album Pockets Fits 300 Photos 4x6 Or 3.5X5 Ret $39. The archival ACID FREE pages photo album for your beautiful photos! Pioneer photo albums are archival, acid free, photo safe See other colors ofMP-300 Photo Albums. This large 3-1/2x5 album has a Black faux leather cover with gold accents. Accepts acid free refills to hold well over 1000 photos. 3 Ring Photo Album 300 Pockets Hold 4x6 Photos Hunter Green. This photo album features a leatherette cover with gold stamping. The 3-ring binding accepts refills (Style No. Photos are displayed three per page. ). Fashion, modern design provide a flash look. Inner material: PP transparent film. Included: 1 x Photo Album. Storage photos well by put them in it. Material: Paper cover. If item is defective after 3 months, you can still send it back to us. Fashion, modern design provide a flash look. Included: 1 x Photo Album. Inner material: PP transparent film. Storage photos well by put them in it. Material: Paper cover. If item is defective after 3 months, you can still send it back to us. Photo quantity : 300pcs. With delicate cover, the album looks very cute, all the joy of your love and adventures through the years in the exclusive photo album. Good wear resistance, fashionable and wonderful for your daily use, also perfect as a c reative gift. Pioneer photo albums are archival, acid free, photo safe. This large 3-1/2x5 album has a Black faux leather cover with gold accents. Accepts acid free refills to hold well over 1000 photos. Clear top-loading pockets hold six 3-1/2" x5" photos per page. This leatherette photo album features gold accents on the cover and "PHOTO ALBUM" on the spine. Uses refill MPR. Photo safe: Acid, lignin and PVC free. Leatherette gold accented cover and spine. Holds 300 3.5"x5.25" prints. Fashion, modern design provide a flash look. Inner material: PP transparent film. Included: 1 x Photo Album. Storage photos well by put them in it. Material: Paper cover. Model: 025. If item is defective after 3 months, you can still send it back to us. FOR INSTAMATIC, DISC AND 35MM PHOTOS. This item has never been used and will hold 300 pictures! CLEAR VINYL, FOLD OPEN PAGES WITH SLIP IN POCKETS. Item is pictured and sold as is. Holds three 4"x6" photos per page; Album Capacity: 300 photos. Archival, acid free, photo safe. Make sure this fits by entering your model number. This fits your. Hard Album Cover. Holds 300 6" x 4" Photos. Album Size 32cm x 21.5cm. Your Right to Cancel ?. Faulty products ?. Claims, other than the right to correction of faults with the product covered by these conditions. New in box Restoration hardware photo album. Black leather. Holds 300 4" x 6" photos. 12 3/4" x 10" length. We strive to describe our inventory to the best of our knowledge. 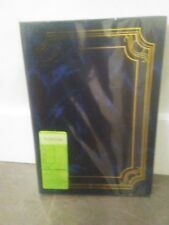 Pioneer Photo Bonded Leather Bi-Directional Le Memo Pocket Album Black 300 Photo Condition is New. Shipped with USPS Priority Mail. 50 pages with 6 4x6 pockets to hold 300 photos. Yellow daisy floral design. 3-Ring Photo Album. Photo quantity : 300pcs. photo size: 4R OR 6". The passing years steal from us one thing after another. Good wear resistance, fashionable and wonderful for your daily use, also perfect as a creative gift. New Uniek photo album. Holds 300 4”x6” photos. Photo Album FujiFilm Instax Mini & Polaroid 300 Films! Organize precious photos! Polaroid 300 Film. - Polaroid Mio Film. - There are spaces beside each photo, so you can write down or draw whatever you want. - Each album holds 48 photos (2 photos per page), can fit for instant photos in 2.1”x3.4”(54x86mm). New 2-Pack Old Town Bonded Leather Photo Album Holds 300 Photos Each (Black). Condition is New. Shipped with USPS Priority Mail. Pioneer Photo Albums Leather Bi-Directional Album 4X6 3-UP 300 Photo Burgundy x2. Pioneer Photo Albums Leather Bi-Directional Album 4X6 3-UP 300 Photo Burgundy (x2). The pockets are optically clear with shaded background that enhance the look of your photos. They are Colored Checker they are a lighter shade Green, Blue, and Pink. Great for Scrapbooking Easy to Cover. Each Album is Approx. 10 1/2"Tall X 8" Wide X 1 3/4"Binding. I do my best to describe and photograph any imperfections. Burnes of Boston ATLAS200 Tabletop Book Bound Photo Album Holds 300 4x6. Condition is New. Shipped with USPS Priority Mail. In very good shape. Has a bit general ise wear/dust on it.